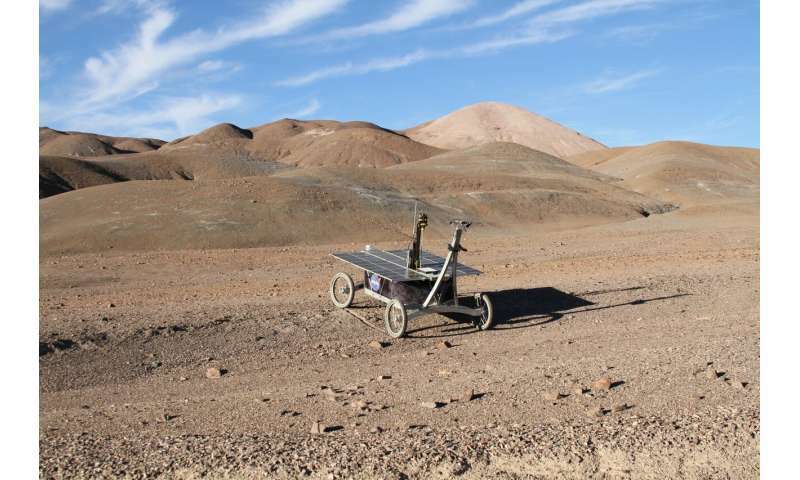 A robotic rover deployed in the most Mars-like environment on Earth, the Atacama Desert in Chile, has successfully recovered subsurface soil samples during a trial mission to find signs of life. The samples contained unusual and highly specialized microbes that were distributed in patches, which researchers linked to the limited water availability, scarce nutrients and chemistry of the soil. These findings, published in Frontiers in Microbiology, will aid the search for evidence of signs of life during future planned missions to Mars. 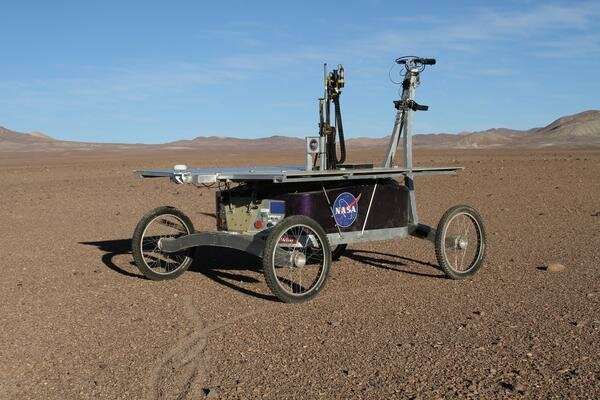 "We have shown that a robotic rover can recover subsurface soil in the most Mars-like desert on Earth," says Stephen Pointing, a Professor at Yale-NUS College, Singapore, who led the microbial research. "This is important because most scientists agree that any life on Mars would have to occur below the surface to escape the harsh surface conditions where high radiation, low temperature and lack of water make life unlikely." He continues, "We found microbes adapted to high salt levels, similar to what may be expected in the Martian subsurface. These microbes are very different from those previously known to occur on the surface of deserts." In 2020 both NASA and the European Space Agency will embark on missions to deploy rovers on the surface of Mars. They will search for evidence of past or present life and for the first time, drill below the surface where refuges for simple microbial life may still exist. To help ensure that these space missions succeed, technology is rigorously tested on Earth first. "The core of the Atacama Desert in Chile is extremely dry, experiencing decades without rainfall. It has high surface UV radiation exposure and is comprised of very salty soil. It's the closest match we have on Earth to Mars, which makes it good for testing simulated missions to this planet," argues Pointing. 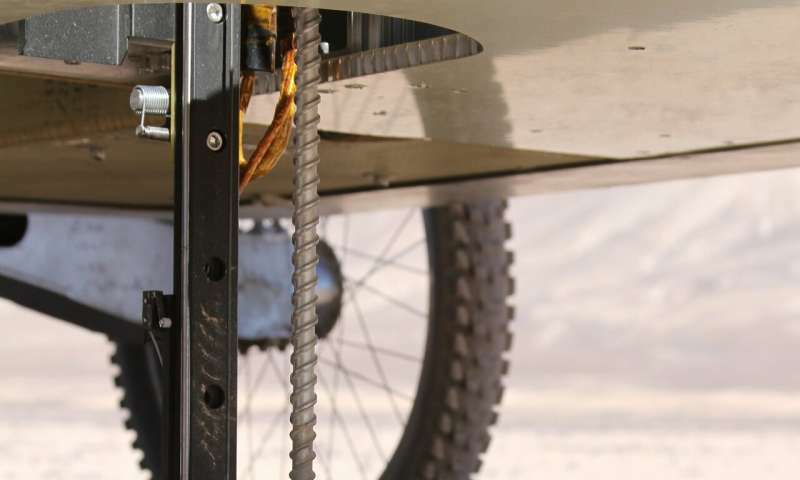 An autonomous rover-mounted robotic drill and sampling device, funded by NASA designed by Carnegie-Mellon's Robotics Institute, was deployed in the Atacama Desert to test if it could successfully recover sediment samples down to a depth of 80cm. Pointing and his colleagues compared samples recovered by the rover to soil samples carefully taken by hand. Using DNA sequencing, they found that bacterial life in the sediments recovered by both methods were similar, indicating a successful deployment, but it also revealed that microbial life was very patchy and related to the limited water availability, scarce nutrients and geochemistry of the soil. "These results confirm a basic ecological rule that microbial life is patchy in Earth's most extreme habitats, which hints that past or present life on other planets may also exhibit patchiness," explain study co-authors Nathalie Cabrol and Kim Warren-Rhodes of The SETI Institute. "While this will make detection more challenging, our findings provide possible signposts to guide the exploration for life on Mars, demonstrating that it is possible to detect life with smart robotic search and sampling strategies." Pointing highlights that future research includes drilling deeper to understand just how far down recoverable microbes occur. "Mars missions hope to drill to approximately 2m and so having an Earth-based comparison will help identify potential problems and the interpretation of results once rovers are deployed there. Ecological studies that help us predict the habitable areas for microbial communities in Earth's most extreme environments will also be critical to finding life on other planets." The title is ridiculous. There is no such thing as Martian life. So nothing can be a clue to it. The writer must be in some fantasyland. Oh, and by the way, life doesn't spring out of nothing. You will never find life on Mars. Period. People don't give up too easy, however. Just please don't waste too many tax $$$ on it. I do not see why You are worried about tax money: You cheat to avoid paying them anyways. Oh, and by the way, life doesn't spring out of nothing. It's turtles all the way down, right? Shouldn't someone actually find, verifiable Mars Life, BEFORE boasting of the still-unrealized accomplishment? This is as ridiculous as the trumpsterfires expectations of reviewing a parade of the Space Force Infantry & Camel Corps! There is no such thing as Martian life. That is the point, we don't know so therefore this science; it is astrobiology and if you don't know anything but makes unsupported claims: https://en.wikipe...biology. And we have known for two centuries that life does not arise spontaneously as earlier believed but evolve from other populations, it is biology and if you don't know anything but makes unsupported claims: https://en.wikipe.../Biology . In general, google - see how easy that was. Torbjorn, no, we don't know that life evolved from other life forms. It is an unproven theory; really a fantasy.. It is not biology. Biology is the study of the living, not the dead. Biology is the study of the living, not the dead. This actually looks like a good way to test this equipment before we spend all the money to send it to Mars.